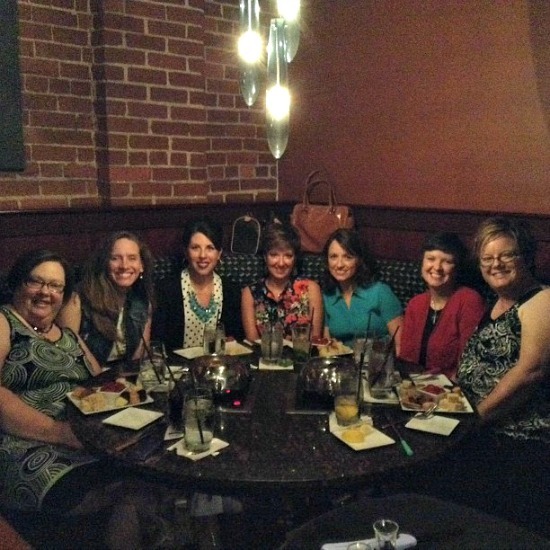 Last week a group of my dearest college friends met in OKC for a few days of girl time. At one time or another, we were all roommates or apartment mates during our fabulous days at Oklahoma Baptist University. Sadly, just a few girls from across the country couldn't attend, but they were with us in spirit! These ladies are so special. We helped each other make it through the ups and downs of college life, have been to each other's weddings, celebrated children's births, and have laughed, cried, and spent time praying together. Now we're all spread out but keep up through Facebook. Their first night in town, we met for dinner at the Melting Pot. I'd never been before, and YUM! If you didn't know, they offer "Happy Hour" between 4-6 where your group can choose 2 types of cheese fondue and 2 types of chocolate fondue, along with a variety of bread, veggie, and sweet "dippers", for around $10 per person. Normally, the Melting Pot is a pricey dinner, but this was a perfect option for us girls and we all loved it. Two words...DARK CHOCOLATE! 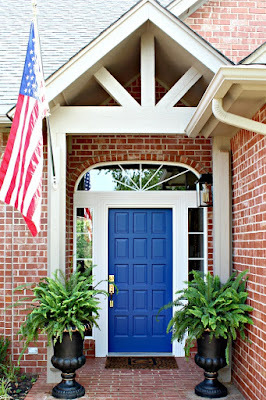 The next day I invited the girls over for lunch and we had the best time just chatting and relaxing, and eating! 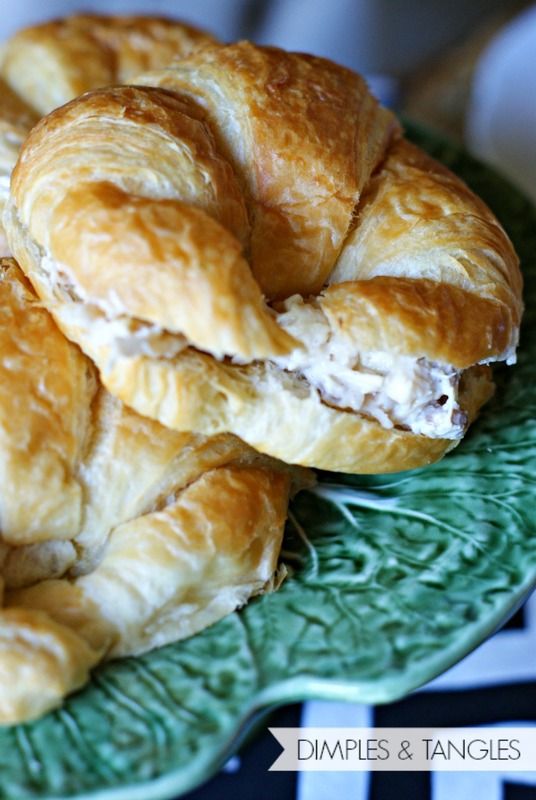 I wanted everything to be comfortable and laid back, so I made chicken salad to eat on the delicious croissants from Sam's, Spinach Salad, and Raspberry Chipotle Cream Cheese Dip. I picked up a couple of bunches of grocery store flowers and used a few milkglass containers to make some colorful, low arrangements. 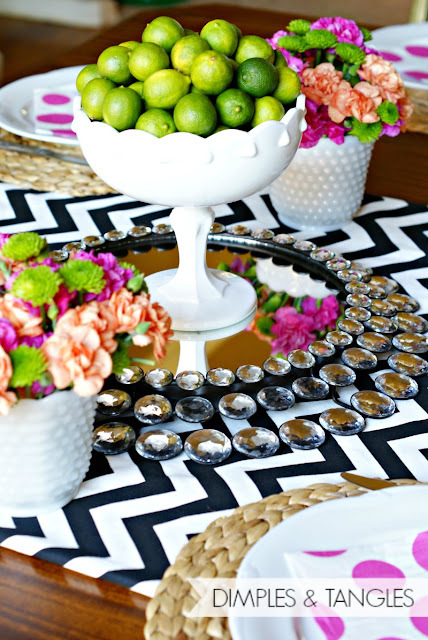 Some fun polka dot napkins, a chevron runner, and Ikea placemats finished off the setting. For dessert, I served Turtle Cheesecake. I saved this recipe out of a Kraft magazine that I got several years ago. I've made it a few times and it's a winner! Here's the recipe if you want to try it too. 1 caution that I've hand-written onto my copy... when you put the cake in the oven to bake, put a rimmed cookie sheet (maybe even lined with foil for less mess) under it. I forgot to do that this time, not thinking about the butter in the oreo crust, and when that butter melted it made a huge mess in my oven! Even with the mess, this cheesecake was totally worth it! I don't have any photos of the process to share with you, because I made it at midnight the night before. But, it's so easy you don't really need them! Mix crumbs, 1/2 c. of the pecans, and butter. Press onto bottom and 2 inches up the side of a 9 inch springform pan. Place caramels and milk in microwavable bowl. Microwave on high for 3 minutes or until caramels are completely melted, stirring after each minute. Drizzle 1/2 of the caramel mixture onto crust. Refrigerate 10 minutes. Cover and reserve remaining caramel mixture in refrigerator for later use. Beat cream cheese, sugar and vanilla with electric mixer on medium speed until well blended. Add eggs, 1 at a time, mixing on low speed after each addition just until blended. 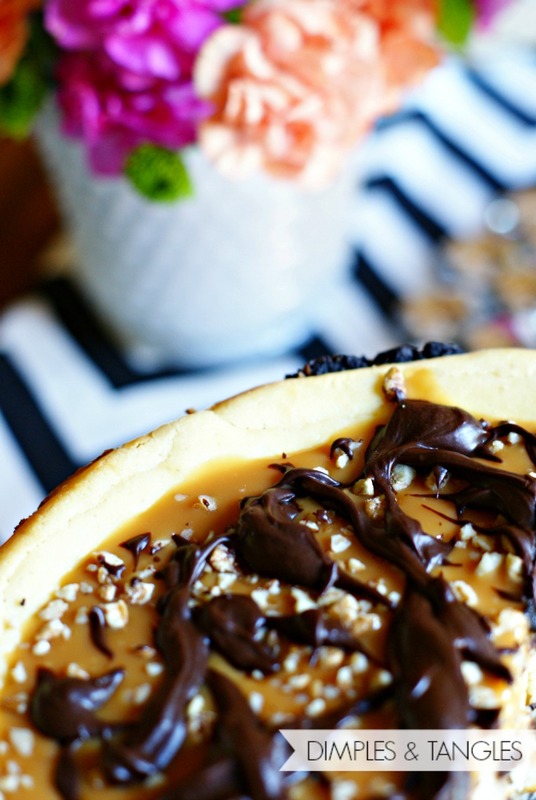 Pour over caramel mixture in crust. Bake at 300 degrees for 65-70 minutes or until center is almost set. Run knife or metal spatula around side of pan to loosen cake, cool before removing side of pan. Refrigerate 4 hours or overnight. Microwave reserved caramel mixture for 15 seconds just before serving cheesecake, drizzle over cheesecake. Sprinkle with remaining 1/2 cup pecans. Melt chocolate as directed on package, drizzle over cheesecake. Store leftover cheesecake in refrigerator. Makes 16 servings. Looks like you all had a great time! 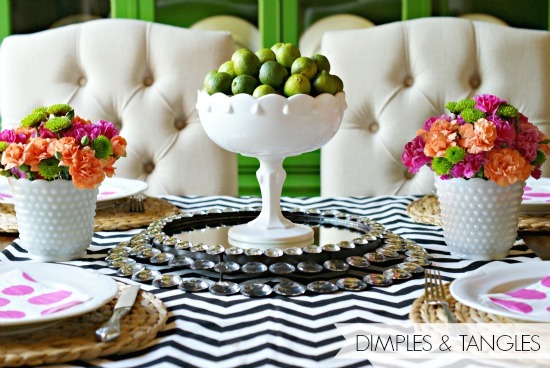 Love the table setting, so fun and cheerful! You are such a pretty lady ... always look so well-put together. Looks like you all had a great time. PS) good to know about Melting Pot - I've never been either. I feel sure they enjoyed being at your home...and table...more than the Melting Pot. :) Everything looks beautiful! 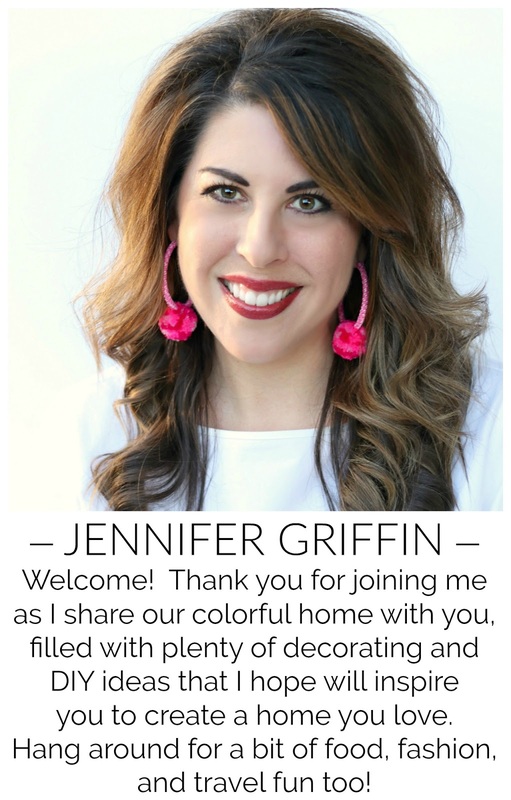 Being in Jen's home is a blessing on every single level. Thank you friend! So glad you shared the cheesecake recipe, I had it on my list to bug you for it this week! What a fabulous get together! Beautiful table setting as well. 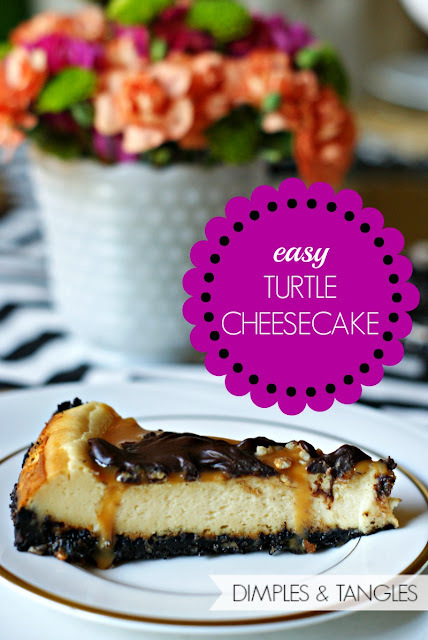 That turtle cheesecake looks delicious - I must make it! How fun to see your friends not once but again the next day. I always find that there is never enough time to cover all the topics that need covering when I see old friends!! 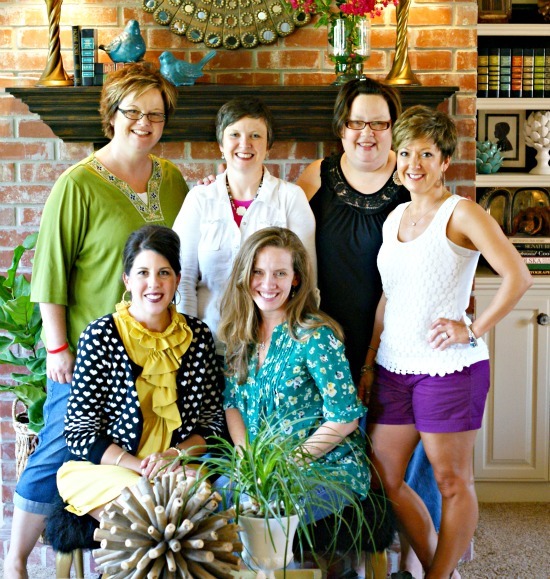 Love getting together with longtime girlfriends! Yes, the Melting Pot is usually so expensive and that's why I never go, because we make fondue at home, but $10 a person is an option. Love your flowers and lime bowl and that cheesecake looks delicious! oh my that cake looks phenomenal, and so does your tablescape. I hope youre having a wonderful summer and good times with GF's are the best! That cheesecake sounds delicious! Looks like you had a great time! Oh my goodness, that cheesecake looks heavenly!!! What a delicious looking dessert!!!! This looks so good. What a fun day.